I’ve already covered release signing Android application in Cordova in a previous article, but sometimes you want to do the same for debug builds. By default, Cordova uses it’s own debug keystore, but it’s easy to customise your project to use a keystore of your choice when creating debug builds. Start by creating your keystore using the keytool command line, as described in my earlier article. If you already have a keystore you would like to use, you can skip this step. Next, we need to create the configuration file Cordova will use to sign your debug build. This is done by creating the debug-signing.properties file in the platforms/android folder of your app. Each of the variables must match the details you used when creating the keystore (or in the Prerequisites step). If you didn’t enter passwords for the keystore (storePassword) or alias (keyPassword), these lines can be removed from the file. 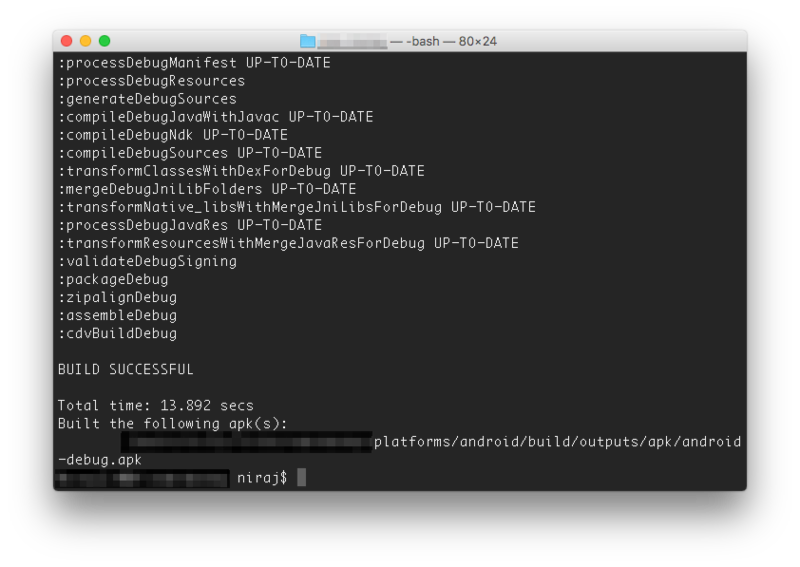 If the build is successful, the android-debug.apk file will be generated in the platforms/android/build/outputs/apk folder. Keep an eye on the output to see if the build was successful, and to find the location of the file. The above screenshot has been modified to hide intermediate output from the build process, and to redact confidential information.